I bet you have been waiting in great anticipation for my next short stack strategy update. I have been purposely waiting until I hit the 50 session hours mark so I could compare my short stack strategy results to my ealier regular cash game project. 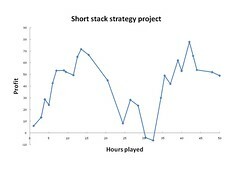 If there is one conclusion I can make on my limited statistics it is that following the short stack strategy probably results in larger swings in your bankroll. Having said that it automatically follows – in my case at least – that the short stack strategy approach is simply more fun. I dislike the long grinding sessions…it’s simply too boring for me. I also like the simplicity of the short stack strategy. You will either be folding or putting it all out there. I have also been playing quite a few tournaments lately to practice some “real” poker. I have had very limited success which has meant a reduction in my tournament bankroll from 300$ to 200$. I am seriously considering cashing out this bankroll because I would hate to lose it all. Join the Poker Bankroll building community on the PokerBRB forum and get support and useful hints from other bankroll building poker players. Get a PokerBRB rakeback deal to maximize your revenues.